Cheap (or best ways) to knock-out / get rid of opponents fielded die? Thread: Cheap (or best ways) to knock-out / get rid of opponents fielded die? Hi guys!! I'm new in this game, and there are so much cards... so I'm looking for the best ways to get rid of a threatening. When fielded, you may pay 2 Mask to knock out one character. I really like this card, because is cheap to buy (even if you must pay 2 mask and field to knock). What other cards do you recommend me to have in mind? Thank you very much!! this are 3 constant cost and 2 fix. So for the first KO you pay 5 and later 3. Instead of her i really like Millenium Puzzle, once its in the game and you ramp really good, this die could always hit the table. Another good character would be Storm 3 Cost to let roll and remove with 50% chance when she is fielded. By "cheap", these are under 4 cost. I'm still a fan of Storm - African Priestess even if she isn't a KO for certain. Last edited by sewnwings; 10-24-2015 at 07:38 AM. Don't forget the common Gamora. I think we can consider "Mr. Fantastic: Brilliant Scientist" Global as a good and cheap "removal" isn't it? For only 1 mask you can force an attack! 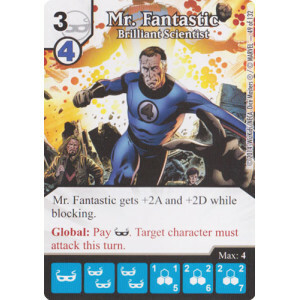 Arch-nemesis BAC from ASM and transfer power global can not only get you a KO on your opponents character, but can even trigger Aftershock effects.